Note: Do not read on if you have not yet seen Season 4, Episode 1 of AMC's "The Walking Dead," titled "30 Days Without An Accident." "The children fastened their eyes upon their bit of candle and watched it melt slowly and pitilessly away, saw the half inch of wick stand alone at last, saw the feeble flame rise and fall, climb the thin column of smoke, linger at its top a moment, and then--"
That's a passage from "Tom Sawyer" that Carol is heard reading to a group of children during "story time," just one of the new luxuries our prison-dwelling survivors of the zombie apocalypse are experiencing in the first episode of Season 4. But just like the flame in Twain's tale -- and Carol's abrupt ending -- those luxuries can be snuffed out before they know it. Not only is there a reading initiative at the prison for the former children of Woodbury who now occupy the cell blocks, they have better security, crops, electricity and societal systems that weren't in place before the gang's showdown with The Governor a few months back. It almost resembles normality. As we are reintroduced to Rick, we see that he's given up on fighting walkers and has taken up a farmer's life. Even though he finds a stray firearm buried in his crops and can see the strength of the fences being tested by the horde, he seems content to focus on cultivating living things instead of killing the undead. For instance, they now have pigs! Her name is actually Violet, but as Rick scolds Carl, they shouldn't be naming the food. Carl, who is no longer constantly armed, has ditched Rick's sheriff hat in exchange for a shaggy 'do and an obsession with comic books. We later see a cheerful Michonne trot into the prison on a horse with more of them for him to read (and an electric razor for Rick because his "face is losing the war"). She's been out looking for their old pal The Governor, with no luck, and is planning on making a solo 70-mile trip to Macon to find him because, "it's worth a shot." Daryl (and many people watching, I'm guessing) isn't so sure about that. 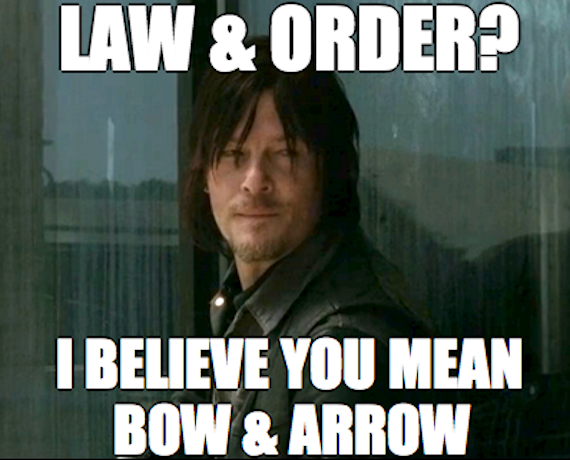 Speaking of Daryl, our bow-and-arrow wielding hero has reached Legend status around the prison. A young newcomer, Patrick, adorably thanks him for providing meat and asks to shake his hand, no matter how much saliva is on it. Later on, another young (and handsome) Woodbury transplant named Zach tries to guess who Darryl was in his pre-apocalypse life and lands on homicide detective, which is hilarious. But back to the storyline. The episode quickly adopts a "small town drama" feel when we are introduced to the prison's current couples. 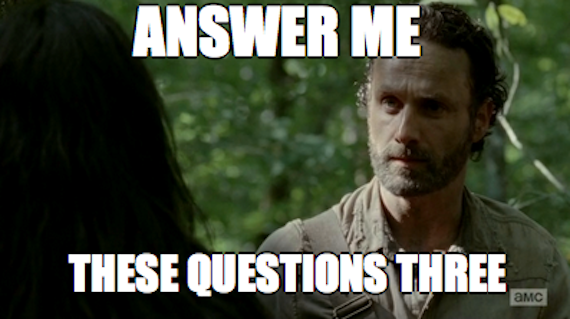 Tyreese has hooked up with Karen, the beautiful Woodbury denizen from season three. She takes on stab-walkers-through-the-fence duty with aplomb and looks good doing it. Daryl and Carol engage in an cute, yet subdued, flirtation throughout the episode. Hershel's younger daughter, Beth, has fallen for the aforementioned cutie, Zach. Meanwhile, Hershel's older daughter Maggie is enjoying whatever form of newlywed bliss she can with Glenn and OH MY GOD ARE YOU PREGNANT, MAGGIE?!?! You're pregnant. Glenn doesn't want you to go on the day's run because YOU ARE SO PREGNANT!!!! Oh, wait. False alarm! As you know by now, AMC had us all going with the pregnancy hints until Glenn got back from the run and Maggie said she's definitely not pregnant. Phew, right? But Maggie also says that if she was, it would all work out. It's the difference between breathing and living, etc. Either way, it's definitely good news that she's not with child. The climax of the episode is the day's big run to a department store led by Darrl, Sasha, Michonne, Tyreese, Zach, Glenn and a guy named Bob who's only been at the prison for a week but wants to "earn his keep." OH GOD, BOB, YOU ARE ALREADY DEAD. At least, that's the feeling I got when he volunteered his services. Chaos ensues. 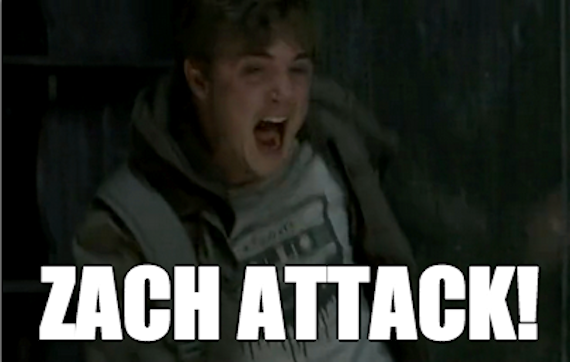 Beth's boyfriend Zach is able to help Daryl free Bob from under the shelf, only to be tragically bitten by a walker AND CRUSHED BY A HELICOPTER. This is even more tragic considering the last conversation he had with Beth in which he was being all cute and asking her to say goodbye, only to have her coyly say "Nope!" and walk away. 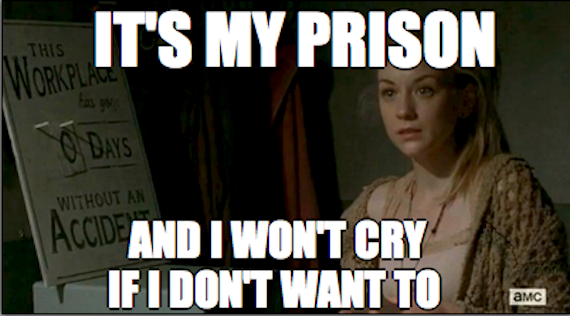 When the gang returns to the prison (minus Zach), Daryl takes it upon himself to break the bad news to Beth. And, while her prison cell looks almost like a typical teen girl's bedroom, her reaction to hearing that her boyfriend was killed is anything but. Homegirl just flips her vintage "Days without an accident" sign from 30 to zero and asks if DARYL is going to be okay. Speaking of people who have lost their significant others, where has Rick been this whole episode, other than on the farm? Mostly in the woods, following an Irish woman (who reminded me of Lady Gaga for some reason) to her starving husband. He gives her a charity sandwich agrees to let the couple come back with him if they can answer three questions, later revealed to be: "How many walkers have you killed? ", "How many people have you killed?" and "Why?" As they walk together, talking of airports and sculptures and other things that mattered before the whole world went to Hell, we become increasingly suspicious of this mystery woman. She explains a little too much about "the things we had to do" to survive, and why it is SO important that she helps her husband. So, it's no surprise when Rick arrives at her camp only to see that her husband is a slowly decomposing walker in a bag. She lunges toward Rick with a knife, begging to let her feed him to her husband, before finally giving up and stabbing herself in the stomach. As she bleeds out, she again begs Rick not to shoot her but to let her join her husband as a walker, mumbling about not being able to "come back." Shaken, he obliges her, takes his sandwich back and heads home. Talk about a blow to Rick's delicate psyche! The dude just got over seeing the "ghost" of his wife, and earlier in the episode is told by Hershel that "the council" is concerned about him not carrying his gun outside of the fences. It's a good thing that he had it with him, even though he no longer resembles a Sheriff. After the incident, Rick confides in Hershel (who at this point in the episode I was almost convinced is a ghost that only Rick can see). We hear more about not "coming back," this time in the sense that people can bounce back from the psychological trauma of this brave, new world. Unlike the woman, Rick has bounced back. He now holds baby Judith confidently and clearly wants Carl to focus on being a kid rather than killing walkers. But when Carl attends "story time" per Rick's suggestion, we find out that the kids are learning some pretty adult stuff after all. Carol cuts off her reading of "Tom Sawyer" to show the youngins how to handle a knife until Carl catches her in the act. Now we might have an idea as to why Carl's fellow teen, Patrick, said he likes attending story time. Except Patrick is now too sick to stay for the lesson. Patrick is sick. Like, really sick. Like, he-was-fine-this-morning-and-now-he's-dying sick. 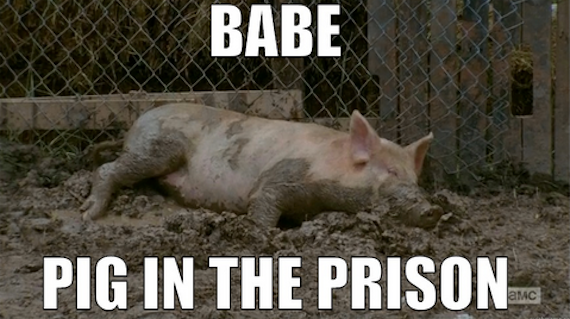 As the episode closes, we see Patrick collapse, just like Violet the pig, and turn into a zombie with red, bleeding eyes, just like a certain walker that caught Rick's attention earlier at the fence. Unlike previous seasons, the enemy of Season 4 appears to be neither a worldwide epidemic, nor a friend-turned-foe, nor a megalomaniacal Governor. It's a sickness that kills you in less than a day and leaves you hungering for human flesh -- inside a secured facility filled with sleeping, innocent men, women and children. Unless that enemy is stopped, it's only a matter of time before the survivors' last candle burns down to the wick. 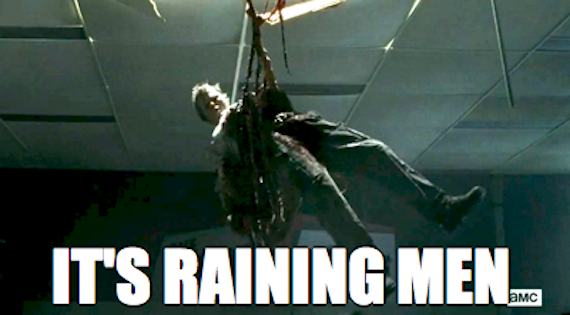 "The Walking Dead" airs Sundays, 9 p.m. ET on AMC.